Find answers to frequently asked questions (FAQs) about conflict resolution. Just click on a question below to reveal the answer associated with it. What is the Office of Civil Rights (OCR) and what type of complaints do they accept? You may file a complaint with the Office of Civil Rights if a school is treating your child differently because of a disability. The U.S. Department of Education’s OCR is a federal agency that ensures that schools comply with Section 504 of the Rehabilitation Act (anti-discrimination law). OCR does not enforce IDEA (the special education law). OCR will probably not solve your complaint about an IDEA issue, which would include IEP issues. For help deciding whether this is the right place for your complaint, see the OCR website. How do I file a complaint with the Office for Civil Rights (OCR)? Remember, you must have proof, a “paper trail,” to show what happened. Send copies of that “paper trail” to OCR with your letter. What is an ISBE complaint, and how do I file? You may file a complaint with the Illinois State Board of Education (ISBE) if the school has not followed special education laws. Examples include not following your child’s IEP. You must write a letter explaining the specific failure by the school and what you are asking the board of education to do. Whatever you are complaining about must have happened within the past year. It is important to send proof of the wrongdoing with your letter, such as the IEP or other school documents. It is best to have a “paper trail” that shows the failure of the school. What do I put in the ISBE complaint? How does the ISBE complaint process work? The ISBE has 60 days to resolve the complaint. To find out more information, see ISBE’s description of the special education complaint investigation process at www.isbe.net/spec-ed/html/complaint_investigation.htm. What is mediation and how do I request it? A parent or school district can ask the state to provide a mediator at any time. Mediation is voluntary, which means both parties have to agree to mediate. 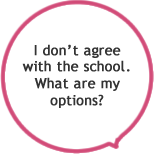 If you or the school does not want to mediate, it will not happen. Either side can stop mediation at any time. The mediation will take place on a date that everyone agrees to. The mediator is an impartial person who will try to help both sides reach an agreement. Mediation is confidential. Anything said at mediation cannot be repeated outside the room or in a due process hearing. Mediation is binding on both parties. It is very important that any agreement be written. An agreement should state exactly what each party will do, by when, and what will happen if the parties don’t do what they have agreed to. How do I request mediation? What is a due process hearing and how do I request one? A due process hearing is an administrative hearing, like a trial, with a hearing officer (judge) and witnesses. You must prepare to go to trial if you file for a due process hearing. You do not need a lawyer, but it is helpful to have one. In Illinois, one research study showed that from 1997 to 2002, parents without a lawyer won only a little more than 16 percent of due process hearings. In the same study, parents who had a lawyer won 49 percent of the hearings. If you use a lawyer, find one who knows special education law before you request a due process hearing. In Illinois, the IDEA 2004 limits due process hearing issues and remedies to two years before the date of the hearing request. You can ask a hearing officer to correct a problem that has occurred within the last two years, but you may not request relief for a problem that goes past that two-year period, unless it is recurring or fits another of some very narrow exceptions. How do I request a due process hearing? Send a letter to the school superintendent and the ISBE (in Illinois). There are very specific rules for what must be in a due process request letter and in the hearing. You can find Illinois’ rules by looking at the website: www.isbe.state.il.us/.